LONDON, England -- Several associations in the alternative medicine industry have joined forces to warn against non-conventional remedies that claim to cure or prevent swine flu. A coalition of alternative medicine groups warned against self-medicating to combat swine flu. The warning comes as a number of Internet sites are promoting various products including dietary supplements and black elderberries as possible cures for swine flu. Only two drugs have been approved to treat and prevent influenza - Tamiflu (oseltamivir phosphate) and Relenza (zanamivir), the Unites States Food and Drug Agency said on its Web site. The industry coalition, which includes the Natural Products Association and the American Herbal Products Association, warned in a statement: "We are unaware of any scientific data supporting the use of dietary supplements to treat swine flu." The warnings were also directed at the sellers of dietary supplements and natural remedies. 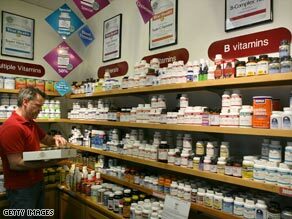 The industry told marketers and retailers not to promote any dietary supplement as a cure or treatment for swine flu. A World Health Organization spokeswoman also cautioned against using supplements to fight swine flu. Saira Stewart told CNN: "We cannot recommend the use of any dietary supplements, because there is absolutely no scientific evidence showing that this may help combat swine flu." The sale of natural remedies has in recent years grown into a world-wide, multi-billion dollar industry. People are turning towards everything from herbal medicine to dietary supplements and homeopathy to cure mainstream illnesses. In the United States, some 38 percent of adults and 12 percent of children use some form of complementary or alternative medicine, according to a December 2008 U.S. government survey. And if swine-flu continues spreading, many more may decide to self-medicate in order to boost their immune systems. This is despite the fact that swine flu has primarily targeted healthy young adults with stronger immune systems -- as opposed to the usual flu, which primarily affects the weak and the elderly. So the group that issued the warning is cautioning against self-medication: "Each of the associations is also committed to recognizing that there are some health conditions for which the choice of self-care should be actively discouraged. "The current global outbreak of swine flu is such a condition." The statements were issued on the same day a strong warning by the U.S. Food and Drug Administration (FDA) and the Federal Trade Commission (FTC) was issued. It said aggressive action will be taken against companies attempting to benefit from the public health emergency. "The last thing any consumer needs right now is to be conned by someone selling fraudulent flu remedies," said FTC Chairman Jon Leibowitz. "The FTC will act swiftly against companies that resort to deceptive advertising," he said in a statement on the FDA Web site. "These fraudulent products come in all varieties and could include dietary supplements ... [and] will not prevent the transmission of the virus or offer effective treatments against infections caused by the H1N1 influenza virus," the FDA wrote.